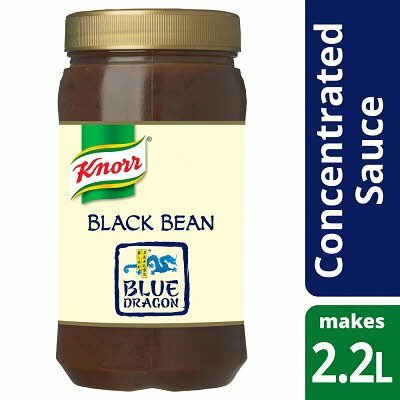 A concentrated black bean sauce combining traditionally fermented soya beans and soy sauce. Water, sugar, black beans (16%) (SOYA bean, salt), modified maize starch, light SOY sauce (3%) (water, salt, SOYA bean, WHEAT, sugar), garlic puree, rapeseed oil, minced chilli paste [chilli pepper, salt, acid (acetic acid)], colour (plain caramel), acid (lactic acid), yeast extract paste (yeast extract, salt). Made in a factory that uses nuts and peanuts.